Medtronic announces results through 12-months from the Post-Approval Registry (PAR) for the Medtronic Micra(TM) Transcatheter Pacing System (TPS), reinforcing the high implant success rate and low complication rate seen since its U.S. approval two years ago. The smallest pacemaker in the world, Micra TPS is the only leadless pacemaker approved in the U.S. New data from the PAR study showed Micra TPS in clinical practice had an implant success rate of 99.1 percent. The PAR study also showed a low major complication rate (2.7 percent) through 12 months post-implant (95 percent CI: 2.0 percent – 3.6 percent), with a 63 percent lower risk for major complication (P<0.001) compared to traditional pacing systems. Additionally, the risk for major complication trended lower in the Micra Post-Approval Registry than in the investigational study (HR: 0.71, 95 percent CI: 0.44-1.1; P=0.160). PAR data also show that Micra TPS is a safe and feasible pacing option for patients with a recent cardiac implantable electronic device (CIED) infection. Among patients in the Micra PAR who previously had a traditional pacemaker explanted due to infection, 98 of 99 patients underwent a successful Micra implant attempt (99 percent implant success rate). No patients who received a Micra device experienced infections that required removal. The global Micra PAR is a prospective single-arm observational study designed to assess the safety and effectiveness of the Micra TPS in the post-approval setting. PAR data presented at Heart Rhythm 2018 were from an analysis of 1,817 patients at 179 centers across 23 countries worldwide, which assessed system or procedure-related major complications through 12 months following implant. These rates were then compared to the major complication rates of the Micra IDE and to a reference dataset of 2,667 patients implanted with a transvenous pacemaker. 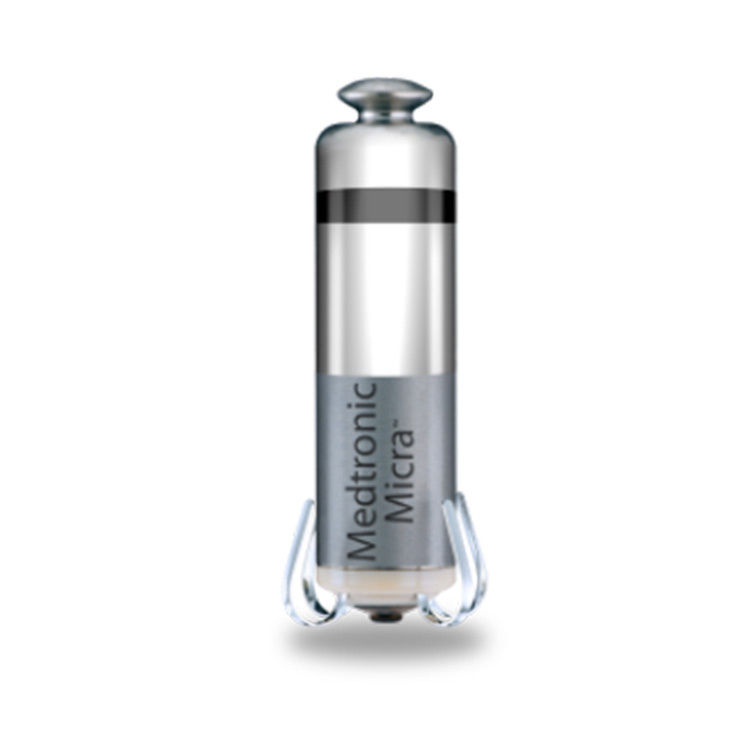 Approved by the U.S. Food and Drug Administration in April 2016 for patients who need a single-chamber pacemaker, the Micra TPS is the first and only leadless pacemaker approved for use in the U.S. Comparable in size to a large vitamin, the Micra TPS is less than one-tenth the size of traditional pacemakers yet delivers the most advanced pacing technology to patients via a minimally invasive approach. During the implant procedure, it is attached to the heart with small tines and delivers electrical impulses that pace the heart through an electrode at the end of the device. Unlike traditional pacemakers, the Micra TPS does not require leads or a surgical “pocket” under the skin, so potential sources of complications related to such leads and pocket are eliminated – as are any visible signs of the device. The Micra design incorporates a retrieval feature which can be enabled, if necessary; however, the device is designed to be left in the body. For patients who need more than one device, the miniaturized Micra TPS can be permanently turned off, allowing it to remain in the body so a new device can be implanted without risk of electrical interaction. The Micra TPS is the first and only leadless pacing system to be approved for both 1.5 and 3 Tesla full-body magnetic resonance imaging (MRI) scans. More on the cardiac rhythm management market in the US can be found in a series of reports published by iData entitled the US Market Report Suite for Cardiac Rhythm Management. This report covers the following market segments: implantable cardioverter defibrillators (ICDs), pacemakers, cardiac resynchronization therapy (CRT) devices and cardiac leads. The iData series on the market for cardiac rhythm management devices covers the U.S. and 15 countries in Europe including Germany, France, the United Kingdom (U.K.), Italy, Spain, Benelux (Belgium, Netherlands and Luxemburg), Scandinavia (Finland, Denmark, Sweden and Norway), Portugal, Austria and Switzerland. Reports provide a comprehensive analysis including units sold, procedure numbers, market value, forecasts, as well as detailed competitive market shares and analysis of major players’ success strategies in each market and segment. To find out more about cardiac rhythm management market data or procedure data, register online or email us at [email protected] for an US Market Report Suite for Cardiac Rhythm Management brochure and synopsis.